A recent study in Frontiers in Bioengineering and Biotechnology showed uBiome and its executives as top inventors in the microbiome industry. 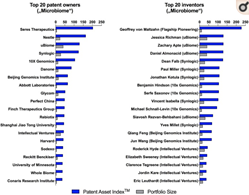 Cumulative value and portfolio size of the top 20 microbiome patent owners and inventors with their current affiliation. From Fankhauser et al. Front Bioeng Biotechnol. (2018).